We were back in Catonsville this week to sing at Matt and Zena's wedding. What a party! Let's just say that the bar has been set high for all future wedding receptions. 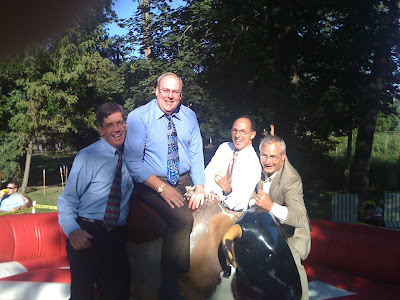 Jeff's extensive training in animal sciences really paid off when we took a shot at the mechanical bull. Tom was able to stay on all the way up to the point when it started moving. The other guys suddenly remembered they had important things to do elsewhere. All in all a great time was had by all. We wish the bride and groom health and happiness and want them to know we've already cleared our calendars for the one-year anniversary party.